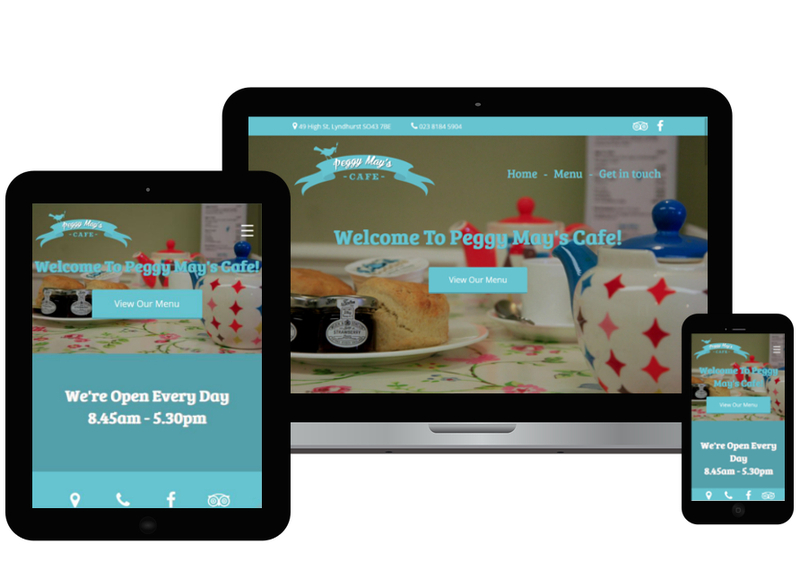 We were contacted to build a new website for Peggy May's Cafe in Lyndhurst. We were asked if we could make them a website that would contain the their menu, links their Facebook page and Tripadvisor page, contact information and an embeded Google map. We visited the cafe, took pictures and got a feel for what the cafe was all about, after this we created a few concept designs and then got started on building the new Peggy May's Cafe website. We went with pastal colours as these were the colours mostly seen throughout the cafe itself. The owners especially wanted users to be able to reach their Facebook and Tripadvisor pages easily; we accomplished this by adding the links to a bar at the top on desktop computers and then a big bar at the bottom on mobile devices, this big bar also included a link to call the cafe and one to get directions via Google maps. We loved working on this project and are always keen to start on a new site for a cafe in the future.